Customized Foldable Sun Ray Sunglasses are great promotional gifts for athletes, players and fans of any game played in a stadium. Players will find these custom sport sunglasses exceptional in keeping their eyes safe from the sun and also to maintain a sporty overall appearance. Meanwhile, spectators will also love to take advantage of these foldable sunglasses to stay trendy and safe from the sun while in the stands. UV 400 protective lenses and optional pouch are notable features of these sunglasses. Order these customizable new arrival sunglasses today to get free online proofs, free design and best price guarantee offers. 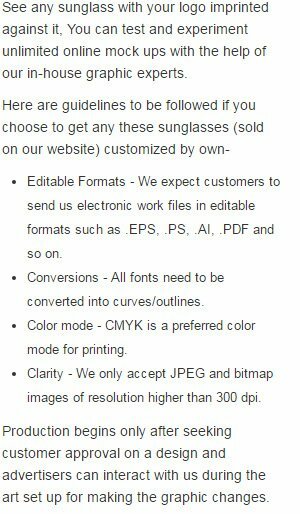 Request a quote to know price cuts that you can avail for wholesale Customized Foldable Sun Ray Sunglasses.